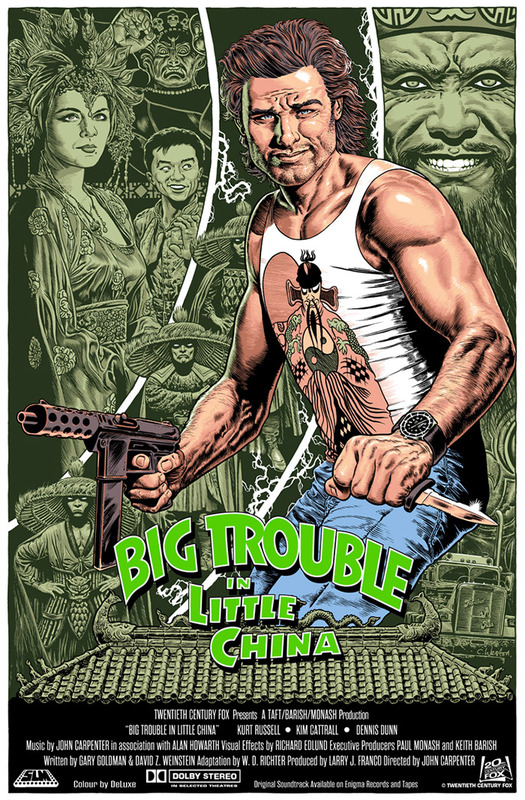 Chris Weston recently declared via twitter it was "Kurt Russell" week (Aug 2013) and then dropped 3 awesome poster designs on his website covering 3 of Kurt’s best films; This excellent Big Trouble in Little China design, One for “The Thing” and one for “Escape From New York”. Amazing work. We’re unsure if they will be made available for sale, I’ll update this post if they do. A true cult film and one of the best from the 80's. Directed by John Carpenter and starring an absolutely brilliant Kurt Russell, the story follows trucker Jack Burton after he agrees to take his friend Wang Chi to pick up his fiancee at the airport, he never expected to get involved in a supernatural battle between good and evil. Wang's fiancee has emerald green eyes, which make her a perfect target for an immortal sorcerer named Lo Pan and his three invincible cronies. Lo Pan must marry a girl with green eyes so he can regain his physical form.